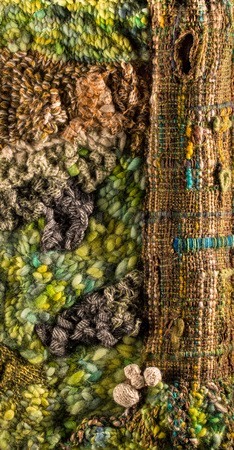 Textile artist Linda Doran shares her news and views on knitting, knitty things and being a knitty artist in a painterly world. I'm assuming she'll be pleased with the compliment! As anyone artistic knows, the creative process sometimes takes a long time to come to fruition and this piece was probably longer than most! So my tale starts almost 4 years ago when I was given a lovely birthday present by my other half Dayve to go to a one-to-one tuition session with Laura at Farfield Mill. It was a beautiful late autumn morning as I recall, Laura welcomed me, we talked about what I'd like to do (we agreed I'd have a go with an Ashford table top loom, rigid heddle, don't worry it didn't mean anything to me either at the time!) and we agreed our day's programme. 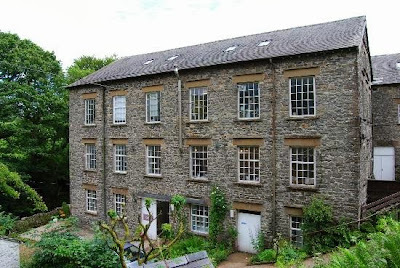 The wonderful Farfield Mill, near Sedbergh, looks (and smells) great! This is Laura ( from her Laura'sLoom Facebook page, backstrap weaving in Bhutan apparently! For the rest of the morning Laura showed me the way that the warps are prepared for the loom, this is a skill in itself! I particularly liked her tale of the bloke who'd been weaving for some considerable time but came to her for a workshop and admitted that until she'd showed him this cunning technique he'd relied on the fact that he had a really long hall to lay out his warps while he set up his loom! Weavers will understand the impractical nature of this 'solution'; for non-weavers I suppose an artist equivalent would be painting with a really long handled brush a long way away from your canvas to get perspective or for knitters it would be like trying to knit with the fleece still attached to a sheep... It reminds me that in all crafts there is a technical body of knowledge built up over many generations that it's really handy to know! We had an excellent lunch and then afterwards we got onto some actual weaving using the warps we'd set up before lunch. I had a brilliant day, it's a wonderful place, Laura's teaching was excellent and it was a good way for a beginner to get an idea of weaving. She kindly offered to let me borrow the loom as she didn't need it for a few weeks and so I had it at home and was able to design and make the piece I had in my head. I was pleased with the end result, only needed to find the right piece of artwork to use it in, and the loom was returned to Laura with much thanks. The famous Ashford Rigid Heddle loom (a handsome devil) this isn't my weaving by the way! Now fast forward the rest of the (almost) 4 years! My woven piece had still not found a place in my textile artwork worthy of it but then I went to Woolfest in June this year and met Laura again. My good buddy Helen spotted the selveges (edges cut from Laura's woven cloth) and immediately I knew that combined with some fab slubby hand spun wool I'd bought already that day from (I think) Freyalyn's Fibres I could create some suitable knitting to go with my woven tree trunk and finally complete the artwork it required. A short time, ie a couple of months, was it all needed to complete my creative vision; my only plan was a hastily drawn and rather wonky sketch in my ideas book and the rest was done by eye. I first knitted a woolly bit in an uneven shape and then tried to knit a selvege bit to roughly match up with it and then did the same again etc. I sewed them together onto a felt backing piece, placed the woven tree trunk in place and used recycled wool-mix material to pad it out giving it a nice slightly rounded contour. I'm pleased with the finished item and like the way the knitted sections work with the woven sections. As it seems to work so well, I had been thinking I might try another mixed technique piece like this... but I fear I may have to stick to knitting as when it comes to warping a loom sadly I've forgotten the cunning prep technique employed and unlike some I don't have a long hall! More about Farfield Mill, if you haven't visited you should go! When I can I'm making textile art or blogging about it; here's my web site; or follow me on Facebook and Twitter for knitting and textile art news. Wow Lindy, I am very flattered indeed and I just LOVE this piece. Can't believe it's four years since I first got you weaving. I still think you do some of the most creative things with your weaving and knitting that I've ever seen. 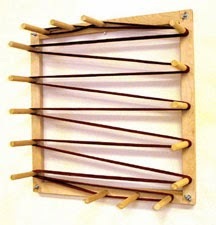 BTW, I know a much simpler way of setting up a rigid heddle loom now so if you want to come over one day I'll show you!